Thomas was expected to get an MRI on the hamstring but he said he didn’t think it was as bad as one he suffered last season that held him out of a game against Tampa Bay. 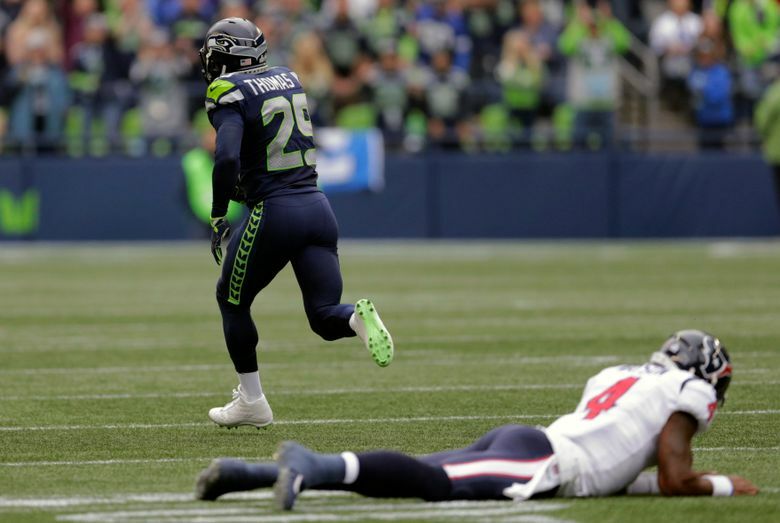 Safety Earl Thomas began Seattle’s scoring onslaught with a 78-yard interception return that tied the score in the first quarter at 7-7. He ended the game on the sidelines after saying he pulled his hamstring on Houston’s final touchdown, a 72-yard DeAndre Hopkins catch and run. Carroll, when asked if there is a concern about Thomas being available next week, said “yep’’ without elaborating. But Carroll also said that Thomas “couldn’t go” on the final series, in which he was replaced by Bradley McDougald. Thomas has been limited in practice much of the last few weeks with a knee injury (as well as missing a few days for personal reasons) and then played, so the team will undoubtedly take it easy on him regardless in preparation for Washington. What Thomas needs mostly these days is film study, which is what he said helped led to his interception. The pick-six game came after Thomas said he was largely to blame for Houston’s first touchdown, a 59-yard pass from Watson to Will Fuller. Watson was trying to hit DeAndre Hopkins, who was being covered by Sherman. The way Sherman told it, Thomas was the “robber’’ on that play, meaning he had no specific man to cover and had the freedom to go where he thought the ball was headed. It was Thomas’ first interception return for a touchdown since 2012, and his first touchdown since a fumble return last year against New Orleans.